This well maintained 3BR/3.5BA waterfront home is located in the Caine Woods community in N. Ocean City, Maryland and is within walking distance to Ocean City's 10-mile public beach. 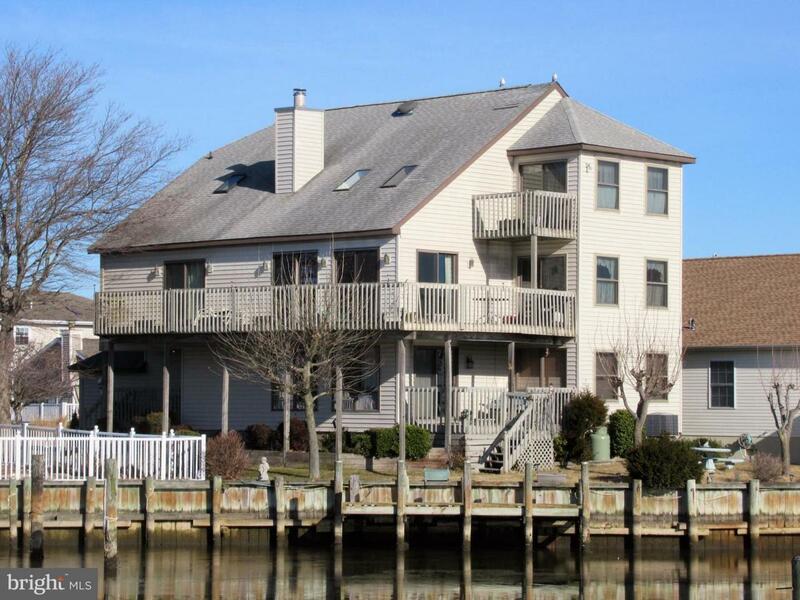 The home is situated on one of the largest waterfront lots in the neighborhood offering beautiful views of the water, the Ocean City skyline and great views of the firework displays conducted at the Northside Park. The location of the property also offers quick & easy access to the open bay. The first level features a 2-car garage, a family room with a gas fireplace, an office (possible 4th bedroom), a full bath, a laundry room consisting of a full size washer, dryer & laundry tub, and a patio door that accesses a sundeck. The 2nd level features a living room with vaulted ceilings and a wood burning fireplace, a dining room, an eat-in kitchen featuring a breakfast bar, Corian counter-tops, stainless steel appliances & a walk-in pantry, 2 guest bedrooms, a bath and a half and 4 patio doors that each access a large wrap-around sundeck. The 3rd level features a master suite with an enormous master bedroom with his & her closets, a patio door that accesses a 3rd sundeck and a master bath that features a large jetted tub, a separate shower and a double sink vanity. There is also a walk-in attic for storage. Additional features of the home and property include a boat dock, a 2-zone heat pump system, a central vacuum and an intercom system. The Caine Woods community features 3 city parks that include 2 picnic pavilions, a tennis court, a racquetball court and 2 tot-lots. All these amenities come with no HOA fees! Listing courtesy of Montego Bay Realty.